Crystal structure of C/EBPbeta bZip domain (pink helices) bound to DNA(spheres.) PDB entry . CCAAT/enhancer-binding protein beta is a protein that in humans is encoded by the CEBPB gene. The protein encoded by this intronless gene is a bZIP transcription factor that can bind as a homodimer to certain DNA regulatory regions. It can also form heterodimers with the related proteins CEBP-alpha, CEBP-delta, and CEBP-gamma. The encoded protein is important in the regulation of genes involved in immune and inflammatory responses and has been shown to bind to the IL-1 response element in the IL-6 gene, as well as to regulatory regions of several acute-phase and cytokine genes. In addition, the encoded protein can bind the promoter and upstream element and stimulate the expression of the collagen type I gene. CEBP-beta is critical for normal macrophage functioning, an important immune cell sub-type; mice unable to express CEBP-beta have macrophages that cannot differentiate (specialize) and thus are unable to perform all their biological functions - including macrophage-mediated muscle repair. Observational work has shown that expression of CEBP-beta in blood leukocytes is positively associated with muscle strength in humans, emphasizing the importance of the immune system, and particularly macrophages, in the maintenance of muscle function. 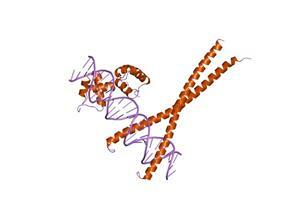 CEBPB is capable of increasing the expression of several target genes. Among them, some have specific role in the nervous system such as the preprotachykinin gene, giving rise to substance P and neurokinin A and the choline acetyltransferase responsible for the biosynthesis of the important neurotransmitter acetylcholine. 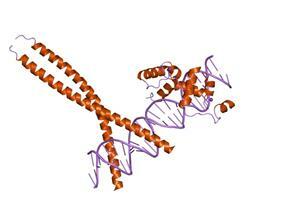 Other targets include genes coding for cytokines such as IL-6, IL-4, IL-5, and TNF-alpha. Genes coding for transporter proteins that confer multidrug resistance to the cells have also been found to be activated by CEBPB. 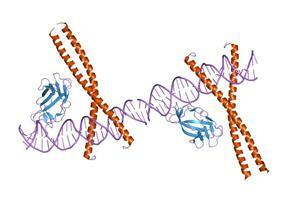 Such genes include ABCC2 and ABCB1. 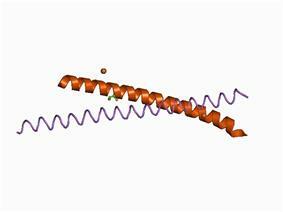 ^ Szpirer C, Riviere M, Cortese R, Nakamura T, Islam MQ, Levan G, Szpirer J (Jul 1992). "Chromosomal localization in man and rat of the genes encoding the liver-enriched transcription factors C/EBP, DBP, and HNF1/LFB-1 (CEBP, DBP, and transcription factor 1, TCF1, respectively) and of the hepatocyte growth factor/scatter factor gene (HGF)". Genomics 13 (2): 293–300. ^ Cao Z, Umek RM, McKnight SL (Oct 1991). "Regulated expression of three C/EBP isoforms during adipose conversion of 3T3-L1 cells". Genes Dev 5 (9): 1538–52. 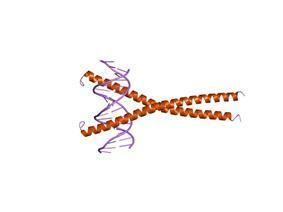 ^ "Entrez Gene: CEBPB CCAAT/enhancer binding protein (C/EBP), beta". ^ Ruffell D, Mourkioti F, Gambardella A, Kirstetter P, Lopez RG, Rosenthal N, Nerlov C (2009). "A CREB-C/EBPbeta cascade induces M2 macrophage-specific gene expression and promotes muscle injury repair". Proc. Natl. Acad. Sci. U.S.A. 106 (41): 17475–80. ^ Harries LW, Pilling LC, Hernandez LD, Bradley-Smith R, Henley W, Singleton AB, Guralnik JM, Bandinelli S, Ferrucci L, Melzer D (2012). "CCAAT-enhancer-binding protein-beta expression in vivo is associated with muscle strength". Aging Cell 11 (2): 262–8. ^ Kovács KA, Steinmann M, Magistretti PJ, Halfon O, Cardinaux JR (September 2006). "C/EBPbeta couples dopamine signalling to substance P precursor gene expression in striatal neurones". J. Neurochem. 98 (5): 1390–9. ^ Robert I, Sutter A, Quirin-Stricker C (October 2002). "Synergistic activation of the human choline acetyltransferase gene by c-Myb and C/EBPbeta". Brain Res. Mol. Brain Res. 106 (1–2): 124–35. ^ Natsuka S, Akira S, Nishio Y, Hashimoto S, Sugita T, Isshiki H, Kishimoto T (January 1992). "Macrophage differentiation-specific expression of NF-IL6, a transcription factor for interleukin-6". Blood 79 (2): 460–6. ^ Davydov IV, Krammer PH, Li-Weber M (December 1995). "Nuclear factor-IL6 activates the human IL-4 promoter in T cells". J. Immunol. 155 (11): 5273–9. ^ van Dijk TB, Baltus B, Raaijmakers JA, Lammers JW, Koenderman L, de Groot RP (September 1999). "A composite C/EBP binding site is essential for the activity of the promoter of the IL-3/IL-5/granulocyte-macrophage colony-stimulating factor receptor beta c gene". J. Immunol. 163 (5): 2674–80. ^ Greenwel P, Tanaka S, Penkov D, Zhang W, Olive M, Moll J, Vinson C, Di Liberto M, Ramirez F (February 2000). "Tumor Necrosis Factor Alpha Inhibits Type I Collagen Synthesis through Repressive CCAAT/Enhancer-Binding Proteins". Mol. Cell. Biol. 20 (3): 912–8. ^ Tanaka T, Uchiumi T, Hinoshita E, Inokuchi A, Toh S, Wada M, Takano H, Kohno K, Kuwano M (December 1999). "The human multidrug resistance protein 2 gene: functional characterization of the 5'-flanking region and expression in hepatic cells". Hepatology 30 (6): 1507–12. ^ Chen GK, Sale S, Tan T, Ermoian RP, Sikic BI (April 2004). "CCAAT/enhancer-binding protein beta (nuclear factor for interleukin 6) transactivates the human MDR1 gene by interaction with an inverted CCAAT box in human cancer cells". Mol. Pharmacol. 65 (4): 906–16. ^ Chen Y, Zhuang S, Cassenaer S, Casteel DE, Gudi T, Boss GR, Pilz RB. "Synergism between calcium and cyclic GMP in cyclic AMP response element-dependent transcriptional regulation requires cooperation between CREB and C/EBP-beta". Mol. Cell. Biol. 23 (12): 4066–82. ^ Mo X, Kowenz-Leutz E, Xu H, Leutz A. "Ras induces mediator complex exchange on C/EBP beta". Mol. Cell 13 (2): 241–50. ^ Hattori T, Ohoka N, Hayashi H, Onozaki K. "C/EBP homologous protein (CHOP) up-regulates IL-6 transcription by trapping negative regulating NF-IL6 isoform". FEBS Lett. 541 (1-3): 33–9. ^ Fawcett TW, Eastman HB, Martindale JL, Holbrook NJ. "Physical and functional association between GADD153 and CCAAT/enhancer-binding protein beta during cellular stress". J. Biol. Chem. 271 (24): 14285–9. ^ Mink S, Haenig B, Klempnauer KH (November 1997). "Interaction and functional collaboration of p300 and C/EBPbeta". Mol. Cell. Biol. 17 (11): 6609–17. ^ a b Boruk M, Savory JG, Haché RJ. "AF-2-dependent potentiation of CCAAT enhancer binding protein beta-mediated transcriptional activation by glucocorticoid receptor". Mol. Endocrinol. 12 (11): 1749–63. ^ Stein B, Yang MX (September 1995). "Repression of the interleukin-6 promoter by estrogen receptor is mediated by NF-kappa B and C/EBP beta". Mol. Cell. Biol. 15 (9): 4971–9. ^ a b Foti D, Iuliano R, Chiefari E, Brunetti A. "A nucleoprotein complex containing Sp1, C/EBP beta, and HMGI-Y controls human insulin receptor gene transcription". Mol. Cell. Biol. 23 (8): 2720–32. ^ Xie Y, Chen C, Stevenson MA, Auron PE, Calderwood SK. "Heat shock factor 1 represses transcription of the IL-1beta gene through physical interaction with the nuclear factor of interleukin 6". J. Biol. Chem. 277 (14): 11802–10. ^ Miau LH, Chang CJ, Shen BJ, Tsai WH, Lee SC. "Identification of heterogeneous nuclear ribonucleoprotein K (hnRNP K) as a repressor of C/EBPbeta-mediated gene activation". J. Biol. Chem. 273 (17): 10784–91. ^ Weber M, Sydlik C, Quirling M, Nothdurfter C, Zwergal A, Heiss P, Bell S, Neumeier D, Ziegler-Heitbrock HW, Brand K. "Transcriptional inhibition of interleukin-8 expression in tumor necrosis factor-tolerant cells: evidence for involvement of C/EBP beta". J. Biol. Chem. 278 (26): 23586–93. ^ Xia C, Cheshire JK, Patel H, Woo P. "Cross-talk between transcription factors NF-kappa B and C/EBP in the transcriptional regulation of genes". Int. J. Biochem. Cell Biol. 29 (12): 1525–39. ^ Hanlon M, Sealy L. "Ras regulates the association of serum response factor and CCAAT/enhancer-binding protein beta". J. Biol. Chem. 274 (20): 14224–8. ^ Sealy L, Malone D, Pawlak M (March 1997). "Regulation of the cfos serum response element by C/EBPbeta". Mol. Cell. Biol. 17 (3): 1744–55. ^ Kowenz-Leutz E, Leutz A. "A C/EBP beta isoform recruits the SWI/SNF complex to activate myeloid genes". Mol. Cell 4 (5): 735–43. ^ Liu YW, Tseng HP, Chen LC, Chen BK, Chang WC. "Functional cooperation of simian virus 40 promoter factor 1 and CCAAT/enhancer-binding protein beta and delta in lipopolysaccharide-induced gene activation of IL-10 in mouse macrophages". J. Immunol. 171 (2): 821–8. ^ Rooney JW, Calame KL. "TIF1beta functions as a coactivator for C/EBPbeta and is required for induced differentiation in the myelomonocytic cell line U937". Genes Dev. 15 (22): 3023–38. ^ Chang CJ, Chen YL, Lee SC (October 1998). "Coactivator TIF1beta interacts with transcription factor C/EBPbeta and glucocorticoid receptor to induce alpha1-acid glycoprotein gene expression". Mol. Cell. Biol. 18 (10): 5880–7. ^ Zhang F, Lin M, Abidi P, Thiel G, Liu J. "Specific interaction of Egr1 and c/EBPbeta leads to the transcriptional activation of the human low density lipoprotein receptor gene". J. Biol. Chem. 278 (45): 44246–54.